Indian companies raised Rs3.66 trillion in the first half of the current fiscal year. Among the various routes they opted for, such as initial public offers (IPOs), follow-on public offers (FPOs), qualified institutional placements (QIPs) and preferential issues, non-convertible debentures (NCDs) were the most preferred. NCDs are loan-linked bonds that cannot be converted into stocks. This instrument offers a higher rate of interest than convertible debentures. According to recent Prime Database data, of the total funds raised in H1FY17, Rs2.73 trillion was via NCDs (on a private placement basis). In percentage terms, this comes to nearly 75% of the total funds raised. So what makes NCDs so popular among corporates? The answer lies in the bond market. With bond yields falling in line with policy rate changes, raising funds via NCDs has become a cheaper source. “Banks are not lowering interest rates across the board even when the base rate comes down since they are grappling with issues of non-performing assets. Besides, the risk premium that they charge is higher. Bond markets are more elastic in terms of reacting to a rate cut and that makes this instrument more attractive," Madan Sabnavis, chief economist, CARE Ratings, told Mint. Muthoot Finance, Mahindra & Mahindra Financial Services, Dewan Housing Finance Corp. and Edelweiss Housing Finance were among the companies that mobilized funds through this route. 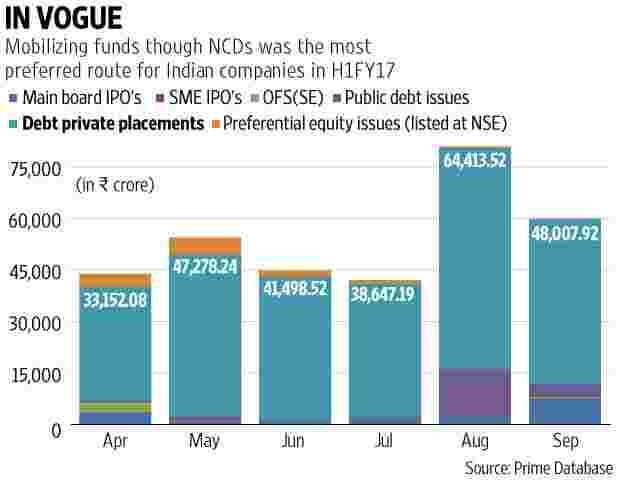 Many financial services companies have been opting for NCDs because for them raising money is akin to sourcing raw material and a cheaper source of fund makes a lot of difference to their balance sheets, Sabnavis added. Most companies garnered funds to meet working capital or business expansion needs. According to experts, raising funds via a private debt placement is preferred over a public issuance because it is a less cumbersome process, while participation is also assured. Will NCDs continue to be in vogue? Experts are optimistic. Recently, mining major Vedanta announced that it will raise up to Rs1,250 crore through NCDs and several others like Apollo Hospitals and Shriram City Union Finance are in the fray to follow suit. “There is demand for NCDs in the market and we expect institutional investors to lap up NCDs provided it is issued by a reliable management," said Sanjiv Bhasin, executive vice-president - corporate affairs, IIFL. Moreover, with bond yields coming down further on the heels of the Reserve Bank of India’s rate cut, the NCD route will continue to look attractive.